It’s fair to say, that not all projects work out how you expect. Some exceed expectations, and others are downright disappointing. Unfortunately, this dress falls into the later category. My stripe placement doesn’t match my style… maybe it’s a little too dramatic for me? As soon as I laid eyes on this striped fabric we were in love. The colours, the wide stripe, the drape, the composition (95% cotton/5% spandex) and the fact that it was a whopping 175cm wide. Needless-to-say, I was at the counter and taking some home with me in the blink of an eye. 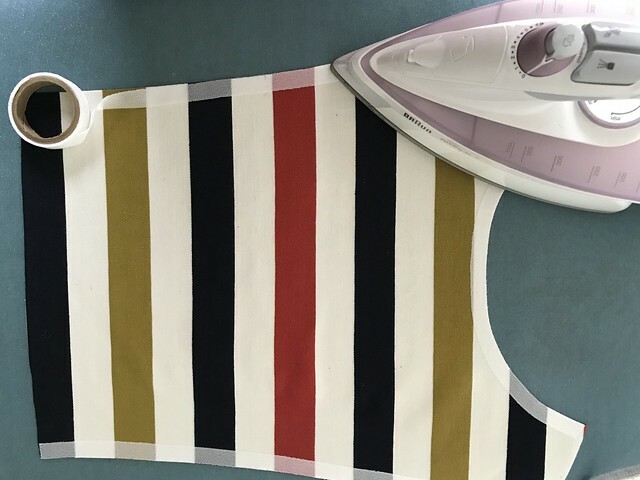 I always use fusible stay tape on the necklines of knit fabric to stop it from stretching out when adding a neckband or facing. In this case, I also added stay tape to the side seams of the front and back pattern pieces as I was worried that the weight of the skirt might drag the bodice down. 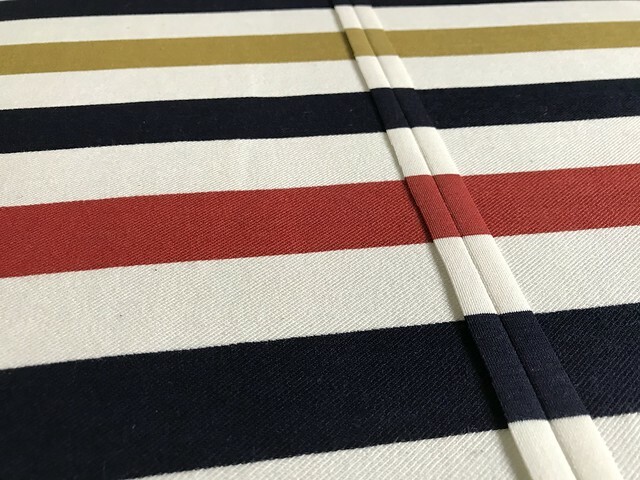 I’ve mentioned it before, but it worth repeating again, I treat stripe matching as a competitive sport. 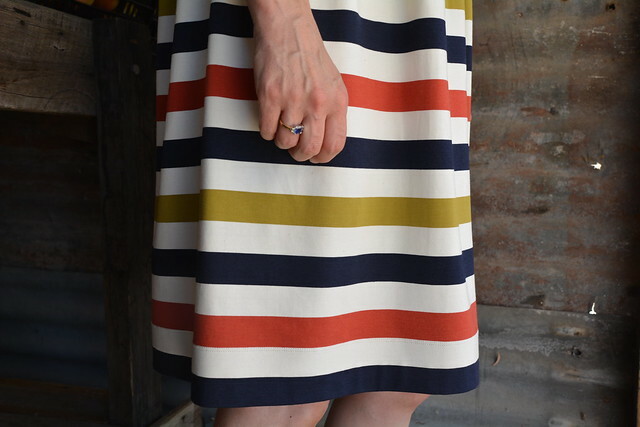 For this make, I used a walking foot and I pinned EVERY SINGLE STRIPE. Sure it takes time, but the results are totally worth it! 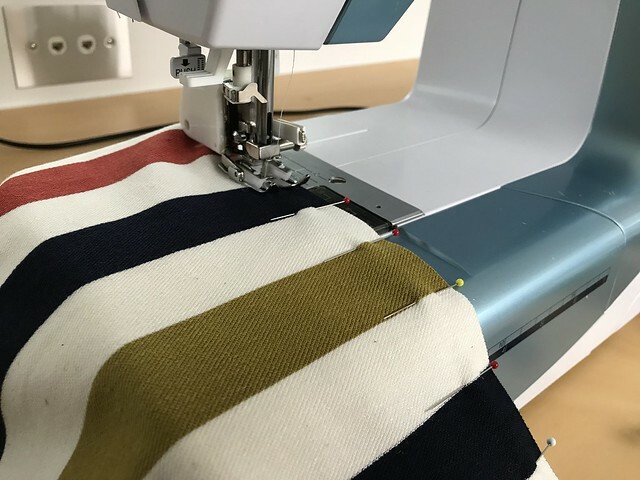 If I’m matching a long seam, I like to make a start and then pull the sewn portion of the seam around to check progress. In this instance, I was totally on track, but if you’re not, then there is much less unpicking! As much as I love a matched stripe, if I can avoid matching, I will. In this instance, my super wide fabric allowed me to eliminate one of the side seams in the skirt portion of the dress. I’m sure you’ve noticed, but I bet you’ve just been too polite to say anything… I have VERY pale and pasty legs. 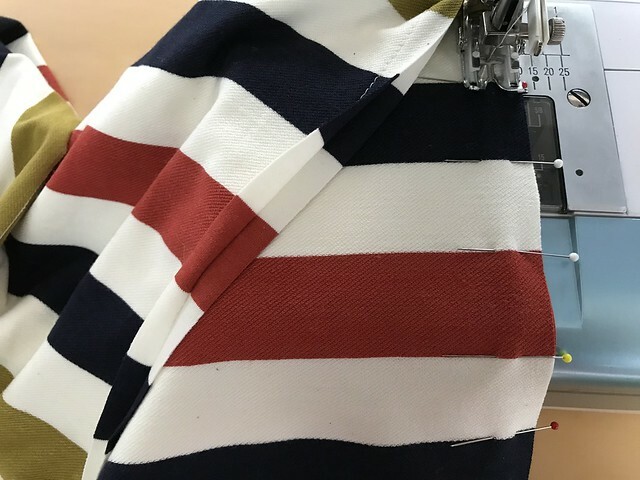 When cutting out a project with light and dark stripes, I always ensured that the darkest stripe is at the bottom of my hem. 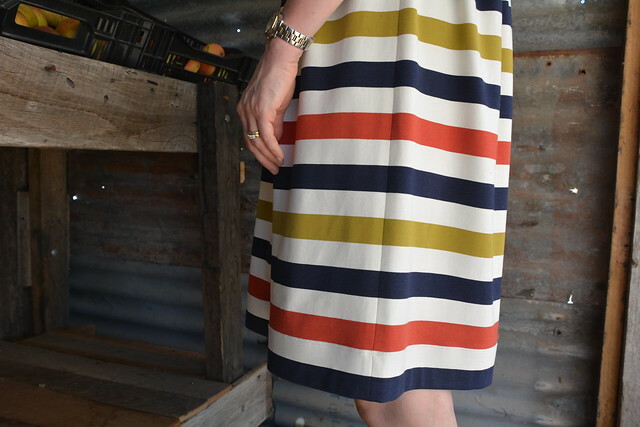 A cream stripe and pale legs… trust me, it’s not a good look! 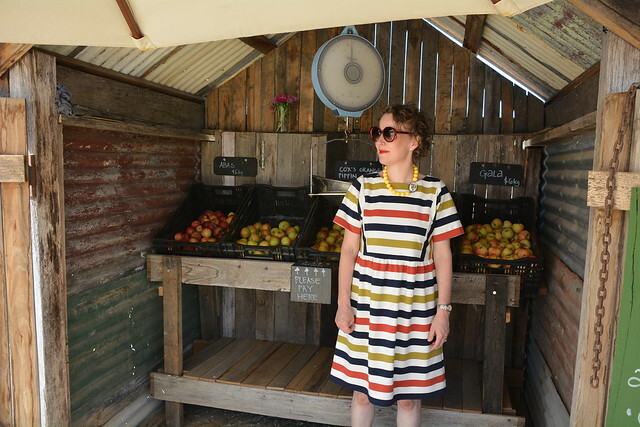 And the apples… well Sharon and I were taking blog photos in Daylesford last Friday and we took the opportunity to visit the #applestore. 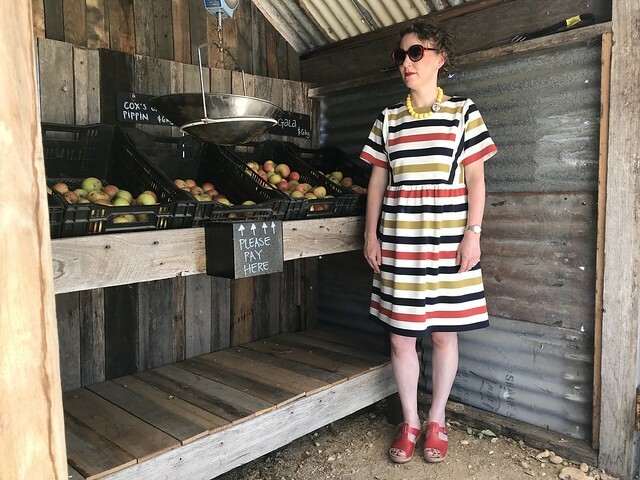 I’ve been a longtime reader of @foxslane’s blog so it was nice to drop by, buy a few kilograms of yummy organic apples and snap these photos. 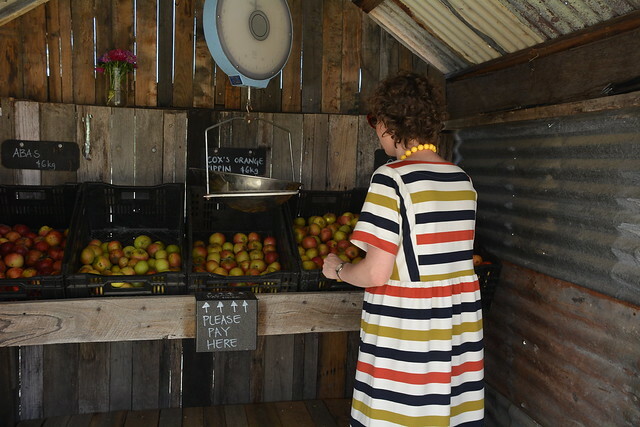 If you’re in the area… go buy their delicious apples! 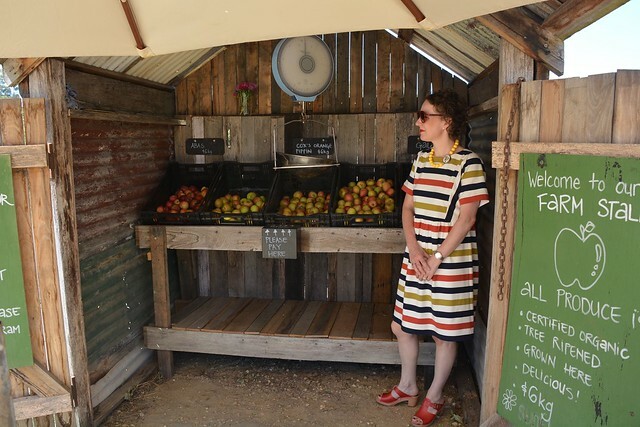 Photo Location: #applestore at Daylesford Organics… see also @foxslane’s blog. Side note: It’s very difficult to photograph during the middle of a very hot day! Although I don’t wish you to fail, knowing I’m not the only one does make me feel a bit better. It’s unfortunate you’re not feeling this dress because you put so much work into it! You’ve mentioned a few great tips. Like stabilizing the neckline. I just cut out a jersey dress with a dramatic neckline and now I’m definitely going to stay stitch!! I’m really pleased you found the tips useful. I love sharing my sewing knowledge. May one suggest? Shorten the skirt to tunic or top length, fix the fit in the bodice, possibly by narrowing the Centre panel but you might have to finesse the side panel as well. Possibly, run a button band down the Centre of the central panel? Perhaps raise the waist seam one more notch? Wear it over jeans, or shorts just peeking out. You sound like you’re in love with the colours and stripes, so maybe it’s worth fussing with the silhouette? Have fun at all events. Thanks for your thoughts Belinda. It was a fun ew, and it fits my friend perfectly, so I’m calling it an overall win and moving on. I’m so bad at revisiting finished projects. What does that say about me? I think it looks very nice on you, to be honest this is the first Lacey dress that I like enough to make me actually want to purchase the pattern and sew the dress. Thanks Jess. I love this dress on the hanger, but not just not on me. I love it that we all have our own preferences. If you buy the pattern, I hope it works out for you. I don’t know if you feel like another go at this but if you do I have suggestions. I don’t think it’s far off this style for you. I would lower the waistline 1-2 cm and then either make the bodice more narrow at the waist or wear it with a belt. But I’m glad this one have found a new home and that you still got something good out of this fabric. Thanks for you thoughts Mie. I must confess I’m more of a ‘moving on’ girl than a going back and trying to change something to see if I can make it right. What does that say about me? I realise there’s probably more to it than this that’s not quite ‘you’ but it occurs to me that if you drastically shortened the sleeves (like to a small cap style) it would be nicer. Still it’s fine to have a ‘not quite right’ now and then, it’s all part of learning! It’s still pretty jolly good but I can see how it just wouldn’t give that thrill factor that we know we can get from me-made! Jane, I have to confess, I love the thrill factor a me-made can bring. I will try putting it on again and folding up the sleeves and seeing if it’s a better look on me. Nothing to loose right? I think I see what you mean – this boxy shape might not be the best style for you. If you want to put in some work to change it, I’d suggest to start by shortening the sleeves (which I imagine is fairly easy to do, for my taste at least the red and blue stripes would have to go) and widen the neckline (which is probably a pain in the … neck, ha!). The material itself is lovely, but there’s too much of it around the shoulder/neck area, it just swallows you. Thanks for your thoughts Ulla. I have moved on. The dress ‘as is’ fits and suits my friend perfectly. Her win and my loss. You can’t win them all! Hmmm, yeah I can see why it doesn’t match your usually stellar sewing results. Funny how that happens sometimes isn’t it. You know, with your great legs, I think you should lop the skirt off and keep it as a cropped boxy tee to wear with skinny jeans. you could definitely pull that off and it would totally lose the minor frump factor that’s weighing this one down. 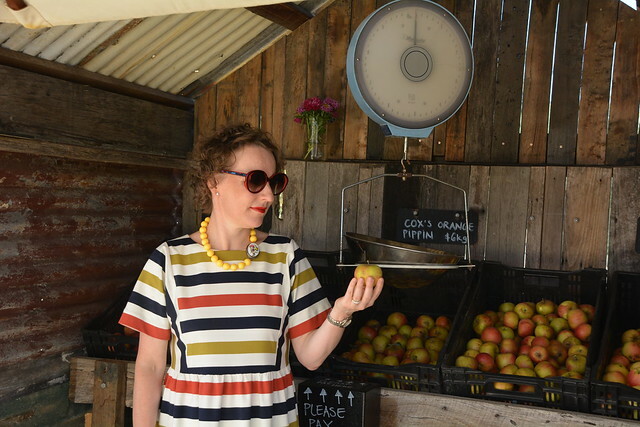 When I tried on the finished dress ‘frumpy’ was the first word that sprang to mind. The dress fits Sharon perfectly, so I’m not going to mess with it anymore. I’ve moved on! That fabric would look fantastic on you as a little cropped jacket. Morris blazer or something like that. Great stripe and colours. I’ve just sewn a boxy Japanese top out of the leftover fabric and I love it. Every cloud has a silver lining! Unfortunate, it’s such nice fabric. Perhaps Lacey would work better for you in a knit, and definitely, a smaller size! I have made a top in the same fabric and I have another length for another dress style. Maybe a lodo dress? I’m not going to rush my decision. Sometimes the best ideas come while fabric is maturing in the stash. 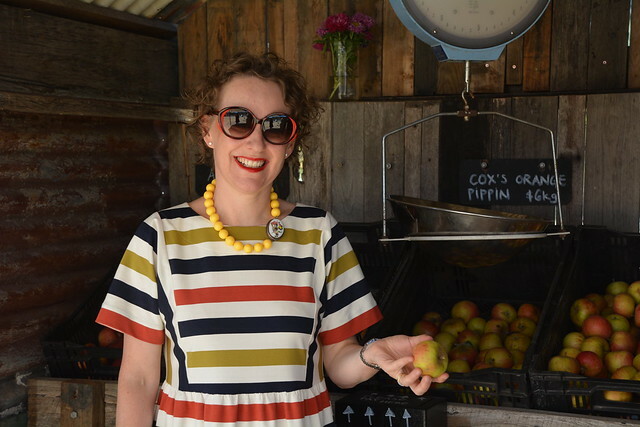 Your comment gave me a light bulb moment… I don’t ever tuck anything in either! Thank-you. oh I feel sad the dress doesn’t feel right. But I totally understand where you are coming from. It was interesting to read a few comments. I did notice a bit of excess fabric on my dress, but I thought it was dues to the shape of the bodice/sleeve. I might try to tweak the pattern for my next version.